Today is Memorial Day in the U.S., a day to remember all the men and women who died serving in the U.S. Armed Forces: Army, Navy, Air Force, Coast Guard and Marines. While much of the workforce in the U.S. takes today as a holiday and marks it as the start of Summer, it’s important to honor the sacrifices made by these brave individuals in service of our country. Stories of remembrance during Memorial Day are often told through traditional news media covering parades or honoring the heroic actions of individuals and units. Social Media also plays a big role in military communications. If you thought creating a social media policy and governance over employee social media activities is tricky, imaging the task of doing so in a military environment. It takes a lot more than a “Loose Lips Might Sink Ships” poster to communicate operational security for soldiers, units and other military organizations that maintain Facebook, Twitter and other social media profiles. Remarkably, the U.S. military has made some significant accomplishments with its use of social media and in many ways, has lead the business community. 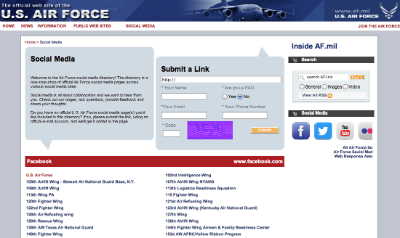 One example of that was in 2008 with the U.S. Air Force publishing their guidelines for responding to blogs. I know at the time, one of the greatest fears companies had of social media revolved around the question, “What if people say bad things about our brand?” and not knowing what to do. That Air Force chart served as a guideline for many companies developing their social media policies. I think there are other lessons to be learned by the business community from the U.S. Military and their social media efforts. Here are 3 of the most important. Social Media Guidelines – Each branch of the service publishes and maintains a set of social media guidelines: Army, Air Force, Navy, Marines, Coast Guard. Probably one of the most important things military organizations can do in their effort to embrace the social web is to create guidelines about overall direction as well as specifics on what to do and not to do. Social Media Handbooks provide leadership and individuals with important guidance ranging from checklists and how to’s to FAQs and resources. Lesson: While social media policies and guidelines have been around in the business community for a long time, many companies simply haven’t established them yet. Those that have, do not maintain them. Whether you start with a basic social media policy tool, thoroughly research and create your own, or work with an experienced outside agency to help create one, it’s pretty important to do so. Then allocate the resources to maintain it in conjunction with your organization’s social media best practices used in marketing, PR, corporate communications, HR, legal and customer service. Social Hub – Many branches maintain a repository of social media profiles and networks in a central location. Others, like the U.S. Army, and U.S. Air Force allow submission of social profiles for evaluation and inclusion in the hub. Aggregating social presence either as a list or by curating messaging (filtered of course) provides both internal (service members, families and other units looking for examples) and external audiences (recruits, news media) with a useful resource. Lesson: Whether your company is small but with a big social footprint, or you have a large enterprise with numerous business units and branch operations, a social hub can provide a central location for internal staff and external audiences to find the right social resources within the organization. Additionally, curating social messaging produced by your brand or talking about your brand can provide an interesting engagement opportunity for those curious about what people “really think” about your business. Some good examples of social hubs that in the technology industry that curate brand messaging include: IBM Voices, Cisco, Dell, Intel. Rich & Meaningful Media – As you can imagine, an all-volunteer military force requires a substantial recruiting effort. 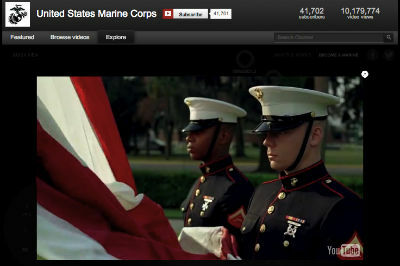 Social Media plays a critical part of communicating the stories and key messages of each branch to potential service members. Soldiers don’t get in the military for the money or because it’s a cush job. Each has his or her own reasons and the job of connecting with those diverse reasons is accomplished through images, video and engaging media that is designed for social media sharing. Lesson: Companies need to understand the interests, needs and goals of those they wish to engage through the social web, whether it’s potential customers and employees, current customers and employees, news media, industry analysts, influencers and investors. When a business can create compelling stories that connect the interests of their target audience with the key messages of the brand, the results can be pretty impressive. As I like to say, facts tell but stories sell. What better medium to tell stories than video? Video is hot for a reason. If a picture is worth a thousand words, a video must be worth millions. The magic of video isn’t just the format, it’s the message and the storytelling that matters. Companies would do well to investigate the role that a rich and meaningful media experience can play for attracting, engaging and persuading their target audience. Without question, social media are a part of the life experience for every individual that participates on the web, whether working for a corporation or in the military. These are just a few examples of best practices worth considering as companies evolve from tactical experimentation to more strategic maturity of the social media operations. What are some social media best practices you’ve seen in a military context that companies could learn from and use? Military and social media have a very tight relationship. Every lesson is important lesson! I love this article! Business owners today just need to use social media networks! Social media lessons are to be learnt for effective utilization of this medium. Social media guidelines play an important role in achieving the target before setting the goals and objectives.Indeed, social media is gaining importance with every passing day and young marketers like me must be on a constant look out for new strategies and initiatives.